Does your local gift store still seem to have the same old Webkinz sitting on the shelf? You just may want to take a closer look once you've read this story. 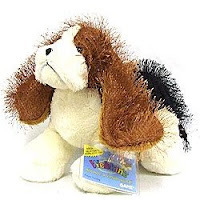 Retired Webkinz Cheap: I was talking to a friend of mine the other day who is an avid ebay seller and she told me the most incredible account of a recent Webkinz purchase she had made. A few months back she walked into a local store and noticed the shopkeeper marking down a bunch Webkinz toys. The strange thing was that most of them were identical and the shopkeeper was marking everything down to get rid of them as they had these in back of the store for quite some time. The shopkeeper commented that they just weren't selling many (although the store wasn't even advertising that they carried Webkinz) and they wanted to just get rid of them. What the shopkeeper didn't realize was that these were the retired Webkinz Cheeky Cat and Cheeky Dog! In fact, there were nine of them total, and being an astute shopper my friend generously offered to by all of them for an additional bulk discount and take them off the shopkeepers hands. Flash forward a few months that $80 purchase turned into over $2,000 in sales on ebay! And after sharing this story with a few close friends, I'm finding that this scenario commonly replays itself around the country every day, so make sure to keep you eyes open for what's hot and you just may find yourself at the right place at the right time. Tip: It's important to make sure that the code for the Webkinz you are buying has NOT been used. A Webkinz with a used tag code is not worth nearly as much! Plus, you need to be careful of flea market knock-off products too. Best bet is to buy from a legitimate trusted retailer, and if buying on ebay, someone with a solid level of good feedback selling Webkinz. So next time you are at that little shop around the corner and you see that a bin full Webkinz, keep this list in mind, you just may find a diamond in the rough. For more information check out Retired Webkinz for Sale or look them up on ebay. Copyright Goldman Stone 2008. Please feel free to publish or redistribute this article as long as it is not modified and all URL's stay intact. As Valentine's Day draws near, and even little ones begin sending Valentine cards to their friends, why not teach (or remind) your child of the true meaning behind the holiday? 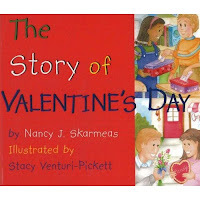 Nancy J. Skarmeas' The Story of Valentine's Day is an effective way to do this. This short book begins by explaining that Valentine's Day is a holiday where cards, candy, and gifts are given to people we like. The illustrations by Stacy Venturi-Pickett show adults exchanging gifts and children decorating with hearts in a classroom setting. Then the author explains, in the simplest terms possible, why February 14th is a holiday. "Long ago, in the city of Rome, there lived a man named Valentine. He was kinds and all the children loved him." The illustrations show an older man holding a Bible. (No mention is made that he might be a priest or monk.) We learn that the King of Rome made a law preventing young men from getting married so they could all join his army and be better soldiers. Valentine, the author says, "tried to help the young men and women." The accompanying illustration seems to show a wedding ceremony. The King didn't like this, so he threw Valentine in jail. The children were saddened, so they made cards and wrote letters to Valentine, hoping to comfort him. One day, a blind little girl brought food to Valentine in prison. He thanked her and prayed with her, and miraculously, the girl could suddenly see. Valentine later sent her a letter and signed it "from your Valentine." Today, the author concludes, we remember these events by sending cards called Valentines. Valentine's Day is a time to show our love for our friends and family and to "remember that all god's children should love one another." What I Like: Valentine's Day is one of those old holidays that's built upon many traditions - some pagan, some Christian, and some secular. It's impossible for us to know exactly who the original St. Valentine was (the Catholic church acknowledges at least three saints of this name), and how much of the story is legend and how much is fact. Nonetheless, this board book does a great job of giving the basic, beginning elements of how February 14th received a special name. It's also a terrific way to help steer the day into a chance to share Christian love. My two year old simply loves this book, and asks to read it again and again. What I Dislike: I've never read the story of the blind girl in any reliable history or lore books or websites; nor have I read that children wrote Valentine letters while he was in jail. That doesn't necessarily mean these things aren't a legitimate piece of lore, but I do question whether this is a part of the Valentine's Day history that should be offered in a book that hopes to pare down the day's many mysteries into one simple board book. As your child develops an understanding of reality vs. fable, you might use the reading of this book to point out which parts might be myth. Also, the illustrations in this book, while not bad, aren't all that exciting. Oddly, the way the illustrator renders each person's face makes them all look nearly the same. Overall Rating: (On the lower end of) Very Good. Age Appeal: According to the publisher, 3 - 5, but my two year old enjoys it, and I think slightly older kids will, too. Publishing Info: Candy Cane Press, 2002; ISBN: 06041845; board book, $6.95. Children's Board Games - Are They Boring? Children today seem obsessed with technology and while I love gadgets and technology myself, with all the advantages that it can bring. I feel we have lost something when our children only play on computer games. My 3 children each have a DS Lite and I frequently see them all sitting on their own, playing on their individual games consoles. You see I am as much to blame as everyone else. When I was growing up, and yes that does make me sound old, I remember very little of my childhood which was not related to games, sitting around at Christmas for example with my family playing cards, trivial pursuits, monopoly etc. I believe playing games is the way for children to learn, they develop life skills by participating and interacting with others. Turn-taking children's games are not only fun to play, they're educational on so many levels, including social and economical. Kids learn about waiting to take a turn, winning and losing, along with co-operation and economics (with monopoly in mind and handling money), the whole time while they have fun. Games come in and out of fashion, and new games appear, whilst the classics get revamped year after year with new themes and are always popular. Children's games are made to stretch the child's mind and even the parents sometimes, without frustrating the child and turning him or her off the game, thus making learning enjoyable. Most kids games are also quite fun to play with mum or dad, with family games being designed to be entertaining for both children and adults alike. If you are looking for something to bring a family together, then you can't go far wrong with any sort of board game. Whilst playing it a family can often get lost inside the game for hours on end. If you are stuck for what to buy a child as a present then you could do worse than buy a board game. I believe it is one of the best presents you can give, because they bring friends and family together and can provide more hours of fun than any book, DVD, or cd you can find. A board game is a team-building exercise (or team pulling apart exercise if you have been sat around our table on many a heated night) you cannot ignore. It is a way of exercising your mind and social skills are built. If you sit and examine the rules and the layout of most games, they all have a common feature, you will see they reflect on everyday life. Whether we are playing snap with a game of cards which is teaching us turn taking for example, exercising the mind to keep it alert and helping with learning difficulties, matching numbers and pictures, or trivial pursuits with team building, knowledge learning and strategy development. Quality educational games are so engaging for most people to play with; children rarely even know they are learning valuable skills, which makes this a fantastic way for them to learn, as information and skills learnt like this, in my opinion, stick in the mind much better than when rules and education is forced. Today, children's games are well thought out, they are fun and compete well with the lure of the solitary video game, if only we give them the chance. Imagine giving a gift that will last longer than the wrapping. Giving one which inspires imagination and brings fun all year long. When you give a subscription to a children's magazine as a gift for Christmas, birthday or any other gift-giving occasion, you are giving a gift that renews itself with each new issue. One month may bring puzzles and games; another may send your lucky gift recipient on a trip through the Amazon jungles, African deserts or outer space. There are magazines aimed at every age group and to suit nearly any interest you - or the child in your life - can imagine. Choosing the right magazine subscription for the very special children in your life is as easy as following a few simple tips. 1.Choose a magazine that's aimed at the appropriate age group. A magazine that's written for kindergarten age children won't hold much appeal for an eight year old. Likewise, a magazine that's aimed at pre-teens will go right over the heads of most six year olds. Don't go strictly on the age on the front cover, though. Some children are ready for real stories when others their age prefer picture stories. Remember that there is some overlap in ages between these groups and let your knowledge of the child guide your choice. Ages 0-3 - Choose magazines with bright pictures and easy activities. There should be few, simple words and sentences and read-aloud stories. Try Wild Animal Baby, published by the National Wildlife Federation, or Babybug Magazine with read-aloud stories for children 6 months to two years, or Turtle, a classic magazine for babies and toddlers and their parents. Ages 4-6 - Preschoolers are ready to start reading simple words on their own, but they still love to hear stories read aloud. Coloring pages and activity pages are a must in magazines for this age group. Also, by this age many children have started to develop specific interests and may enjoy magazines that highlight them. Highlights for Children has been around for decades, but it's still one of the top magazines published for this age group. Other choices for preschool to first graders include Cricket magazine, Humpty Dumpty magazine, and Disney and Me magazine from Disney. Ages 7-9 - By second or third grade, children are ready to start reading on their own - and they want stories about real things that interest them. They still enjoy activity pages, but the editorial content of the magazine becomes more important. Look for colorful, fun and engaging artwork and informative stories with a fun slant to them. A great choice for this age group is Nickelodeon magazine. Ages 10-13 - The split between magazines for boys and magazines for girls becomes really evident at this age. Even so, there are plenty of magazines that both boys and girls will love, including National Geographic Kids and Dig magazine. Ages 14+ - Many popular adult magazines have made a foray into publishing for the "young adult" category - teens from about age 14. This is the age where special interest really comes into play, but there are still more general magazine choices for this age group. For boys, Boys Life is a perennial favorite, but Sports Illustrated for Kids is currently extremely popular. Magazines for girls have come a long way since Seventeen. While that magazine is still going strong, it's joined by Discovery Girls magazine, Cosmo Girls, Girls' Life and many more. 2.Choose a magazine that is geared to a child's interests. In a child's early years, most children have not developed specific interests. By age six or so, though, many children already have started to explore specific interests. Many of the most popular children's magazines focus on interests like history, travel, wildlife and the creative arts. If you're looking for a gift for a child over five, let their interests guide you. National Geographic and the National Wildlife Federation both publish a stepping stone series of magazines aimed at different age levels. Your Big Back Yard, Ranger Rick, National Geographic for Kids and Zootles are just a few of the many magazines aimed at children of different ages that focus on animals and the worlds in which they live. Like many adults, kids are fascinated by science and technological things. Magazines about explorers and inventors, space and archaeology can spark a lifelong interest and love that eventually becomes a career - or remains a fascination forever. When you give a gift subscription to a magazine like Dig, Muse (from the Smithsonian Institute) or Odyssey, you may be opening the door to new worlds that will engage your children for the rest of their lives. Bring history and culture to life for your children with a gift subscription to a magazine that explores the lessons of history or the impact of culture in stories and articles that they can understand and enjoy. There are a number of kids magazines that focus on historical personalities and events, including Cobblestones (ages to 8 years), Learning Through History (ages 7-14) and Calliope (5th to 10th graders). Is your child a young writer? Children love to see their own works in print. Some of the best children's magazines are those that accept and publish only submissions from other children. Check out the magazine New Moon (for girls ages 8-14).